Intricate detailing and a refined sense of scale makes the Rote collection a particularly stunning addition to the Bert Frank portfolio. Resolutely contemporary, Rote speaks of sophisticated industrial aesthetics and calculated design. Available in four versions – pendant, wall sconce, table lamp and chandelier – Rote is comprised of slotted, laser cut diamond leaves fitted to an internally and externally illuminated brass ring. Satin brass and black leaves combine in geometric perfection to create a stunning lighting centrepiece that brings a unique silhouette to any interior space. As an individual pendant, Rote is perfect for creating a focal point over a smaller dining table as well as being grouped in multiples. 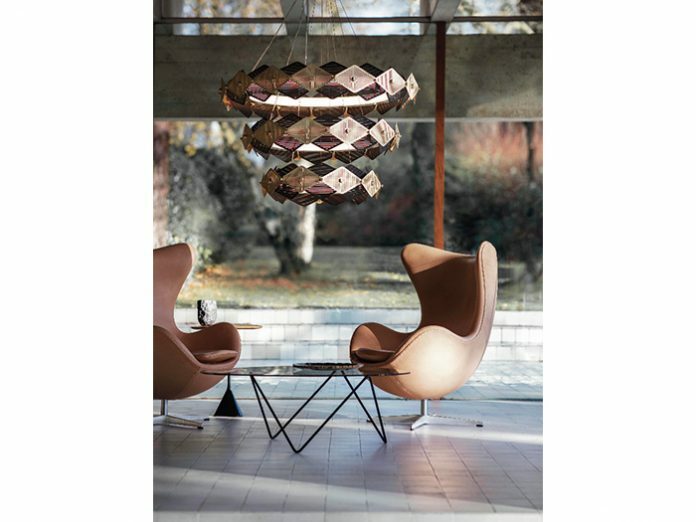 The chandelier is an accumulation of the small, medium and large Rote pendants and acts as the ultimate centrepiece to any large room or hallway. The table and wall sconce versions provide the Rote aesthetic but in more compact proportions, perfect for smaller spaces or highlighting key areas of a room.